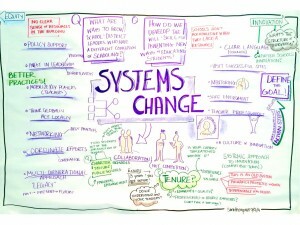 Equity, innovation and systems thinking: these were the themes that marked our 20th Anniversary Education Forum. Our hope was that participants would engage in discussion about actions they could take to address these themes and in doing so, improve educational opportunity for students. A few weeks ago I sent to all participants a video highlighting the September 9th event and asking participants what they took away from the day that influenced their work. I want to sample a few of those, and also describe the impact our discussion had on CTL. One take-away for me is the equity piece since we are currently working on a state plan for Ensuring Equitable Access to Effective Educators, so that the students most in need have access to the best teachers. I think that what I brought away from the day was some ideas about equity and providing more resources (especially time) to those who require additional resources to make up for the fact that some children start at a very different level of preparedness due to familial issues obviously beyond their control. We have begun a program this fall, which was partly informed by this one day, to provide Saturday and summer programming in literacy for 60 students who are at risk of being retained in the primary grades. We hope that intense literacy instruction will lead to increased achievement in all areas and increased student success. We also hired a family liaison to work with parents in a low socioeconomic school to help them overcome barriers to helping their children. At CTL, our experience in convening so many thoughtful educators on September 9th has influenced our current goal setting process, steering us toward a new set of goals that include more active steps in promoting our vision of school and advocating for greater equity, innovation and systems change. In developing more than 80 school walkthrough reports this fall, our narrative comments were influenced by our discussions in September, causing us to focus more directly on how these three themes play out in schools, and how education can be “reinvented” to provide engaging and challenging work for each student. We maintain a firm commitment to this vision. In January, we completed a small study for the Southern Education Foundation on innovation in five southern states including Kentucky. Our reporting and findings were influenced by our exploration in the months leading up to the anniversary event, and by the continued habit of keeping our eyes open for more examples of truly innovative practices. Just today I read an article about Taylor County, KY schools that offer six different instructional models to meet diverse learning needs and to prevent students from dropping out: This innovative district lets students choose how to learn. These models include project based learning (a model that CTL promotes and is currently implementing in three schools), online classrooms, peer-led, self-paced, traditional, and an original design called Cardinal Academy where students develop their own learning plan under the guidance of an academic advisor. The district is committed to a student-centered approach and provides a strong example of what can be accomplished when educators take a chance on innovation. I welcome your comments and any examples you’d like to share of innovative practices, efforts to increase equity, or systems thinking. If you would like to learn more about the thinking that emerged from our 20th anniversary event, follow this link to a video we produced: http://youtu.be/l7CzjicC0pM. 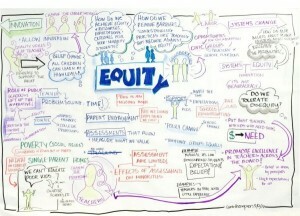 Also, the graphic recordings at the beginning of this blog capture key ideas from our discussion. This entry was posted in Blog and tagged CTL 20th Anniversary, equity, innovation, Next Generation Professionals, systems change. Bookmark the permalink.